Save up to 20% on select South Fork American trips with Rapid Deals, including Class II Tom Sawyer Float trips. For real, the South Fork is one of the most popular whitewater rivers in the world–and for good reason. 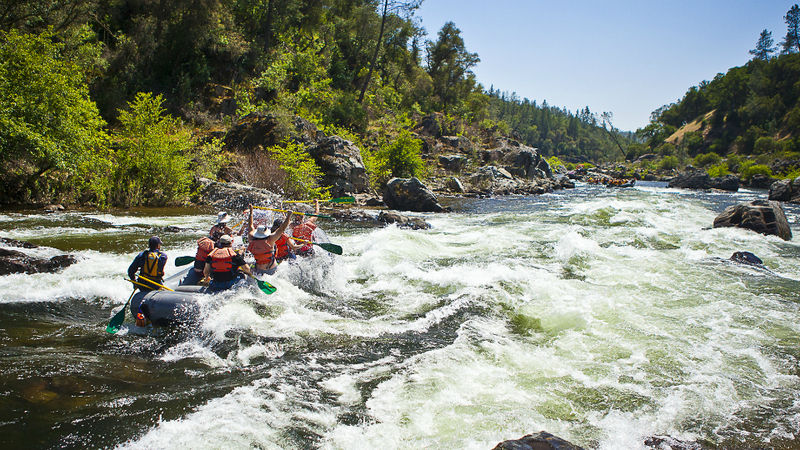 Abundant Class III rapids with their splashy waves and bouncy twists and turns are a delightful way to cool off as you follow the meandering journey of the river from the foothills down to the entrance to Folsom Lake. The raftable section of the South Fork is about 21 miles, which is one of the reasons it offers so many river trip options. For most people, doing the whole section in one day seems daunting, so most folks choose to raft either the Upper “Chili Bar” section or the Lower “Gorge” run. The advantage of the Upper is that it starts out immediately with the wild and wonderful Meatgrinder rapid, beginning your day with a rush! Once you reach the Coloma-Lotus valley, and after running the infamous Troublemaker rapid, you have a leisurely float to take out. The Lower section is the opposite, beginning with tranquil Class I water and fun Class II ripples, and ending with a Class III bang once the river enters the tighter and twistier confines of the gorge. Other options include overnight trips and Class II floats. Overnight adventures give you chance to see the entire river in two days, with a fun camp-out in between. Spend the night under the stars and let us do all the cooking! If you have very small adventurers, consider the Tom Sawyer Float trip, a gentle journey through the Coloma-Lotus valley designed specifically for young children. The Class III sections of the South Fork are typically appropriate for those from 8 to 80 years old, and the Tom Sawyer Float trip was designed for kids as young as 5. This accessibility makes the South Fork the ideal family river, and a natural fit for mixed groups as well, whether that means a group of friends, co-workers, or even bachelor and bachelorette parties. Learn more about the South Fork American and the available trip options. Check out our South Fork American video to see this river up close and personal.